Being able to see where you're going is an essential part of driving to say the least, therefore getting rid of that build-up of the white stuff on your car is very important. When the weather's taken a turn for the worse, make sure you give yourself extra time to sort out your car. If you're in a rush, the job’s probably not going to get done properly. Use a snow brush to push all the snow off the top of your car. 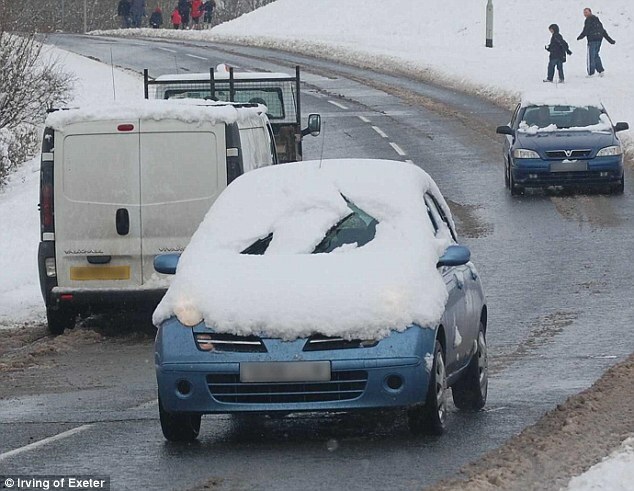 This will prevent the snow from flying onto the windscreen of the car behind or even sliding onto your own windscreen when you brake. Next get your ice scraper and get scraping. Make sure you put your back into it, or if that doesn't appeal, use de-icer. Now that's done you can pick up the broom again and ensure that your reg. plate, lights and exhaust pipe are all clear.